Typus Orbis Terrarum II world map tapestry shows the gorgeous work of Ortelius in Antwerp from 1598. In this tapestry we see the map of the world or mappenmonde showing a piece of history where the Flemish cartographer and artist Abraham Ortelius (1527-1598) displays his skills of map making as well as decoration. In the 16th century, cartography was a result of a collaboration between explorers and sailors who travelled the world to distant lands and mapping the distances and contours of the lands as they travelled. As a result, they created rudimentary maps upon which cartographers and artists would use their scientific precision as well as using elements from art and mythology to decorate the work to make it a grand and elegant marvel for the eye. Here we see the work of Ortelius known as Theatrum Orbis Terrarum or Theatre of the World, which is considered the world's first atlas, the original of which was first printed in 1570. He produced a Latin, as well as versions in other European languages, and kept revising the work until 1598. 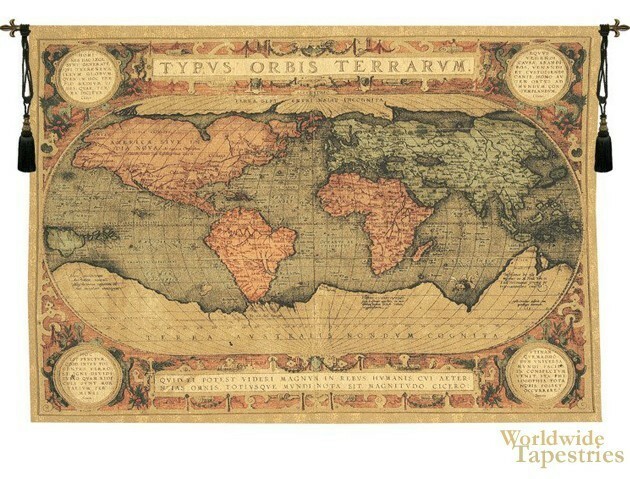 Typus Orbis Terrarum II world map tapestry is backed with lining and has a tunnel for easy hanging. Note: tapestry rod and tassels, where pictured, are purchased separately. Dimensions: W 80" x H 56"